In case you’ve missed the coverage, U.S. teachers are striking across the country, most notably in conservative states like Arizona, Kentucky and West Virginia. And today, fired up educators are making their case for higher pay in Oklahoma, one of the lowest-paying states for teachers in the country. 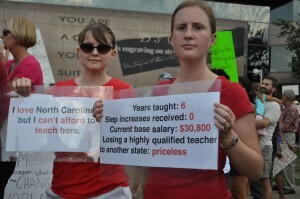 The advocacy comes at a time of growing scrutiny surrounding teacher pay, long a flash-point in North Carolina as well. Of course, many of those protesting today face a different set of state laws than North Carolina, which does not allow for collective bargaining or strikes among state teachers. Thousands of public school teachers across Oklahoma will stay out of the classroom – and many will take to the streets — starting today, after they rejected a pay raise they said fails to compensate for some of the lowest educators’ salaries in the country. “We need more money for support staff, we need more money for the state education budget, we need more money for the cost of living adjustment for retired teachers,” Greg Oppel, a social studies teacher at Edmond Memorial High School was quoted by NewsOK as saying. Given North Carolina laws, the state’s K-12 teachers aren’t planning their own walkouts, according to N.C. Association of Educators (NCAE) President Mark Jewell, whose organization lobbies for the public school agenda at the N.C. General Assembly. But the organization is planning an advocacy day in Raleigh May 16, which is the day state lawmakers are scheduled to return to session. State lawmakers have approved teacher pay raises in recent years that raised North Carolina’s national ranking to 35th, with average pay falling just short of $50,000, according to a report last year from the nonpartisan National Education Association. However, the state’s overall per-pupil spending ranks among the lowest in the nation, and textbook funding lags pre-recession levels, advocates say. I do not understand how educated people can ignore the incredible labor movement of our 1920s. The riots, the police brutality, the elite calling upon the National Guard in Ludlow, CO to put down the strikers with bullets. This movement produced much of the rights that are now enjoyed by educators. The 40 hour week, you have now lost this? Fair salary, you have now lost this? Right to bargain, you have now lost this? How much more are you going to give to our aristocracy? Was the Labor Movement’s message lost on you? From my perspective, public schools are simple tools of the left. I’d just shut ’em down. I’d also cancel state funding which usually is an amount per pupil. I’d issue “education savings account” vouchers to the parents to be used immediately in any accredited school or held until one becomes available. Trust me. Private enterprise works. We’d see countless schools spring up all around us. The bad ones soon would fail and the good ones soon would grow. Some of the striking teachers would flip burgers and some would land well-paying jobs in private schools. Let’s face it. A public school is a monopoly in a nation where a monopoly is a criminal enterprise for everyone else. Teachers who won’t work can be fired or retired early, just like everyone else. I’d add that the state could rent parcels of vacated schools to specialized private schools. Cafeterias already are run as concessions. And athletic property could be leased to clubs or schools specializing in athletics. Same for music rooms, et al. What can we, as parents and concerned citizens, do to help support our teachers? I’m already supporting candidates who will fight for funding. What, specifically, can we do NOW, May 16, and before the elections? I have taught in both public and private schools and I can assure you that turning schools into a business would be a disaster. A public school is not a profit-making organization, nor should it ever be. Schools serve so many functions beyond education that it would be impossible to list them in this small space. Teachers for the most part love students, encourage them, seek a multitude of ways to have their students succeed, to have better values, to appreciate the genius that is America, and all the while are held to very high standards. All educators, staff, administrators that I know work many hours for which they are not paid, frequently must seek outside employment to supplement their meager salary. Yes, private schools may sometimes provide these same services but the bottom line (money) must always be the goal. Why do you think DeVos wants the wealthy to take over schools, love of students, love of education, I think not. If you were to spend some serious time in public and private schools, I suspect your limited “perspective” would grow.